The word "Diamond" was derived from the Greek word "Adamas" and this means "unconquerable and indestructible". In 1477 the Archduke of Austria gifted a diamond to Mary of Burgundy. This was the earliest record of man gifting diamond to a woman. Diamonds worn from ancient times till date and were believed to promote strength, invincibility and courage. To produce a single one-carat diamond, 250 tons of earth will be mined. The diamond is the hardest natural substance found on the earth. Diamond is a birthstone for people born in the month of April. Diamonds were first discovered in India and then at Brazil. Diamonds have very large melting point of 3820K (3547' C/ 6420' F) and a boiling point of 5100K (4827' C/ 8720' F). Most diamonds found in nature are between one to three billion years old. Biggest diamond known in universe weights 2.27 thousand trillion trillion tons which is 10 billion trillion trillion carats, or a 1 followed by 34 zeros. The largest diamond ever found was the Cullinan at 3106 carats. 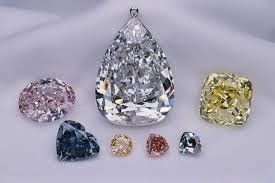 Color of diamond is usually pale yellow to colorless, but can also be brown, blue, green, orange, red, pink and black. Greek historian Pliny wrote that "diamond baffles poison, keeps of insanity and dispels vain fears". Romans believed that diamonds had the power to ward off evil and wore them as talismans. They inherited this belief from Indian mythology.